Though they're hard at work on Pirates of the Caribbean: On Stranger Tides, apparently Johnny Depp is already eager to work with director Rob Marshall again. 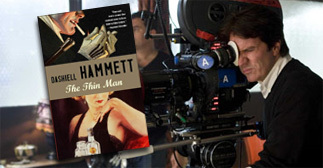 Vulture reports the actor has been "aggressively courting" the Chicago filmmaker to sit in the director's chair for The Thin Man, an adaptation of Dashiell Hammett's 1934 novel that would star Depp himself. The only thing that my prevent the quick reunion upon completion of the swashbuckling sequel is the lack of a script for the adaptation. In addition, Marshall is will be meeting with Universal to discuss directing an adaptation of the Wizard of Oz inspired musical Wicked. Of course, every big name director under the sun is being considered for the Wicked gig including J.J. Abrams, James Mangold and Ryan Murphy, so Marshall's involvement is very much up in the air at this point. But since that project actually has a completed script, that may make it a bit more enticing for the director. Marshall might be eager to get back to a musical, but pairing him with Depp for a twist on the old fashioned detective flick sounds quite interesting. Either way, Depp is producing the project at Warner Bros via his Infinitum Nihil production banner. Hammett's novel follows Nick Charles who, after marrying wealthy, young socialite Norah, gives up a career as a hard-boiled gumshoe to become a semi-professional alcoholic and full-time trophy husband. The original story spawned a six film franchise at MGM back in the day with William Powell starring as Nick Charles and Myrna Loy playing Nora Charles, but I doubt that's a franchise is in the cards for this new adaptation. Could be a great role for Depp no matter who end up directing. Interested? I love the old Thin Man series. Let's hope they pick someone elegant, yet funny, for Nora and not some way-too-young waif. If they adapt the gritty, harder edged novel instead of the original film's script, I'm all for it. The tone of the two are totally different. An outright remake is a waste of time. Love the Thin Man, seen it this summer for the first time. Johnny Depp would be great as Nick Charles and for Norah, I think Cate Blanchett. Big fan of Hammett, this must be done well!